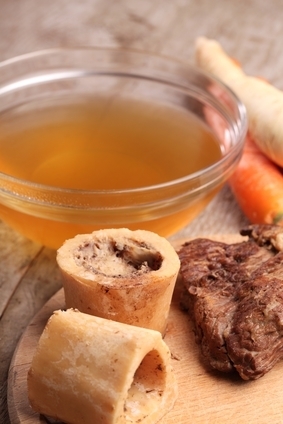 Homemade bone broth is the “backbone” of nearly every traditional diet around the world. <see what I did there?> “Snout to Tail” eating means that everything was used, and not only were people not squeamish, most of the improper bits that bother you (and yes, me at times) were the delicacies of the day. The kids and I recently read “Julie of the Wolves” where she talked about “Eskimo Butter” as a delicacy, a piece of a seal’s small intestines mixed with blubber (fat) and eaten raw . Science had to study what ancient people groups knew all along, that various animal parts contained high concentrations of the vitamins and minerals needed for health and strength. Health is a major reason to make and consume homemade broth. It is anti-inflammatory, it boosts your immune system, and it can heal a wounded intestinal tract. Instead of listening to my non-medical self try to explain the many health benefits of bone broth and why you should be making this a routine part of your diet, you’d be better off listening to Dr. Kaayla Daniels’ 45 minute lecture on Youtube. 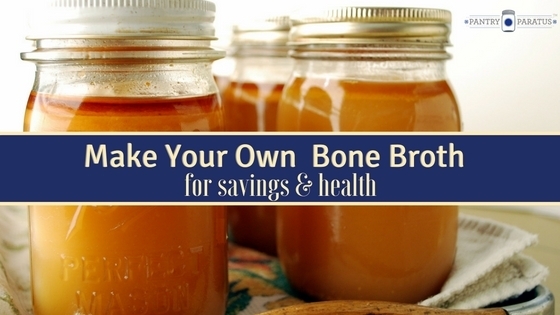 Frugality is a fantastic reason for making your own bone broth. In our house, a full, grass-fed chicken costs far less than it’s various parts wrapped in styrofoam and cellophane because we measure food cost by the number of people served and the number of meals. We usually roast the whole thing for the first meal. Then we pick the meat of for at least two more meals–sometimes sandwiches, sometimes casseroles, sometimes chicken salad. We boil the bones, cartilage, and fat–usually mixing in some onion, garlic, and herbs–for the most delicious homemade broth! Store-bought boxed stuff does not come close. The store bought broth isn’t made with the same ingredients, so it cannot compare to either the health benefits or flavor of what you can make at home. There is no use attempting homemade broth if you are not starting with a pastured, grass-fed animal. I know that initially, it seems that this meat is much more expensive, but you have a few ways of going about it. First, I highly recommend you scour your local farming community for grass-fed meats. We are, for instance, paying $3.20/lb for grass-fed beef because we buy it as a quarter of a cow, instead of in a plastic package in the grocery. Costco’s price per pound for grass-fed (as of today) was $8.30. Once you’ve worked out the grass-fed meat, turn to what other ingredients you may like to add. There are times I make straight broth with nothing else, but it is bland and I usually have a specific purpose in mind. Instead, it’s best to add garlic and onion (both excellent immune-boosters), some salt if desired, and other herbs. Carrots and celery add depth, but should be removed with the bones and other ingredients during the straining process. Remember that most Italian herbs are high in Iron and make a fantastic bowl of broth that will warm you from the inside out. You can drink your broth straight, which is recommended for those overcoming digestive or allergy concerns, and straight bone broth is excellent to detoxify. I use most of it in other recipes, though, which guides how I make it. Although Italian spices are usually my preference, I know that I might be using it to cook rice or other grains, to make a nourishing soup, or a casserole. In such cases, I tend to make it plainer for the versatility of the thing. 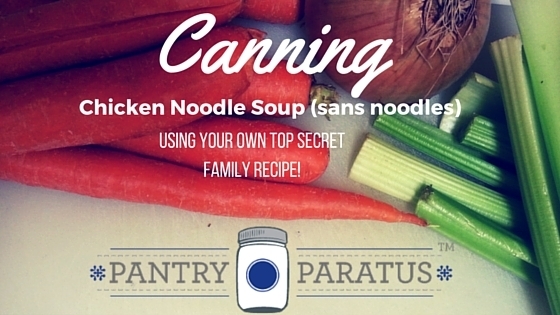 You will want to include everything from the roasting pan when making broth. Use all of the bones and marrow, the cartilage, and the gelatin left in the pan. In fact, those “odd bits” are what add the deeper nutritional value. When I bake a chicken, I always bake the neck, gizzards, and other parts that I know won’t interest my family. When I make the broth, they are in there, adding much to both the flavor and nutrition. After you put the bones, other ingredients, and water into the stock pot, put it on simmer and forget about it for days. Days. Poultry broths should simmer for about 24 hours but we find that other meat broths get richer with 2-3 days of simmering. Taste it. You will know when it’s done by it’s rich flavor. You will need to occasionally skim this bubbly foam that forms on the top of the broth. If the broth doesn’t smell great at first, don’t worry! 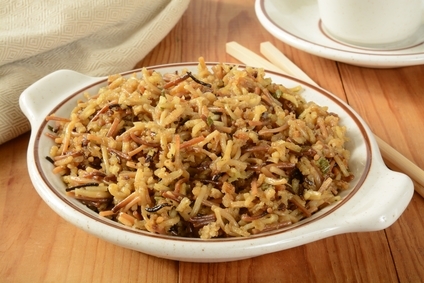 You’re pulling out anything that is not of benefit, and it will improve in color and flavor as it simmers. The healthier the animal, the less of this foam it produces, it seems. There is a very natural, important component of homemade broth called glutamine, and you need it. It does cross what is called the “blood-brain barrier.” This is a great thing, and for most people it has a calming effect. Some people (such as children with autism) who do not have the natural chemical balancing in the brain may actually experience a hyper effect if they get too much. The longer you boil your broth, the healthier it is, but the more glutamine it contains, too. If you have someone in your family who seems hyper after eating homemade broth, do not simmer your broth as long. Over time, the effect should minimize. For the sake of both health and time, I usually freeze my broth. I can move it to the refrigerator the night before I plan to use it, and it has had minimal processing. I do like to have canned broth on hand. Remember you must pressure can broth (not water-bath can) because it is a low-acid food. This high heat does kill some of the nutritional value, but it means that I can store large amounts of broth when freezer space is at a premium, and it means I can take bone broth along while traveling or camping. Usually, if I am going to can homemade broth, I throw in some other raw vegetables too, so that I have a homemade chicken noodle soup (minus the noodles, of course) for a quick meal or gift for sick friend. Give it a try this week! I recommend starting with a chicken or turkey, since it is a bit faster. Search out a local source for pastured poultry this week, and plan a roasted bird for your menu. Then come back here and leave a comment! I am new to a lot of “this”, but I am so disgusted with the quality of the food out there! I have been slowly, a little faster now, turning my family to clean eating/living. I have a way to go, but I am learning! Some things I have known about, thanks in part to a family member who is a nutritionist/natural health practitioner, and the rest is self teaching. My question is.. can you make bone broth in a slow cooker? I am just worried about leaving the stove on that long, we live in an older house with some older wonky wiring. Also, If I am buying my meats in the store, some of the packaging is straight forward, but some is not. What is the verbiage that I am looking for to be sure that I am truly buying a safe and clean meat? I find that packaging/labeling to be a little confusing, especially since so much un-truth is allowed! One other question.. Can you make bone broth in a pressure cooker? Congrats to you! It’s a journey for all of us, and sometimes we take a stumble on it. We learn from the stumbling, though…so keep moving forward! Yes, you can make bone broth in your slow cooker! I tend to make bigger quantities, but I have done it before. For fear of giving you bad advice, I did some research for you, though. I recommend this article http://spiraeaherbs.ca/nourishing-herbs-for-your-bone-broth-slow-cooker-bone-broth-recipe/. I don’t make bone broth from run-of-the-mill “Jennie-O’ or “Butterball” or anything like that. We used to raise our own birds, but currently buy them from a trusted local farmer (we met at the farmer’s market). We see a HUGE difference…when you roast the bird and you’ve eaten your fill at dinner, the cold remains should get a thick, orange-ish gelatin to it. The more gelatin, the healthier the bird. Throw ALL of that into the pot! I highly recommend finding a local source. It doesn’t have to be organic or anything, but looking a farmer (or homesteader) in the eye goes a very long way. I see you had one other question–about using a pressure cooker. There was a paleo blog, and then Food Renegade, who recommend it as being a faster method…I don’t do it. I set it in a pot on simmer all night long and halfway into the next day, but I tend to follow “Nourishing Traditions” method of cooking. Although a proponent of pressure cooking much of the time, I just want time to do it’s work to break down the tissues, impart flavor, fat, and collagen, and…well…sometimes you can’t rush goodness. It wouldn’t hurt one bit if you want to try it. Come back and let us know what you thought!